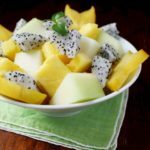 This refreshing fruit salad is made with dragonfruit, honeydew, carambola, and pineapple, and tossed in coconut water and honey. So cool and sweet! Combine the honey and coconut water and whisk until honey dissolves. Combine the fruit in a large bowl. Pour the coconut water and honey dressing over the fruit and toss lightly. Garnish with mint sprig and serve immediately.